I've been consistently hitting up this little spot in Doral for lucnh and it's about time I share it with you. 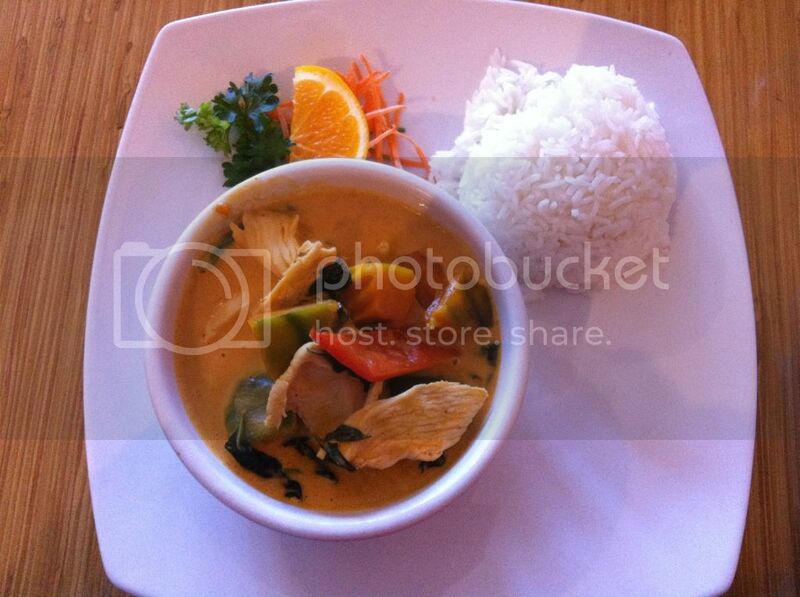 It's called Doral Thai Restaurant and I should warn you, it's pretty addictive. When I fist visited, the first thing that caught my attention was the giant line of people waiting outside the restaurant during a busy lunch hour. I decided to pull in and check it out for myself. The small restaurant sits about 50 people and this place was bursting at the seems during a busy Thursday lunch rush. Big crowds aren't always a clue that a restaurant is good, but it was definitely enough to pique my interest. I sat down and a woman with a very thick Asian accent took my order. For starters I went with their Tom Kha Gai soup, which is a Thai soup with coconut milk, lemongrass, lime juice, mushrooms and chicken breast. Over the top it came garnished with chopped cilantro. 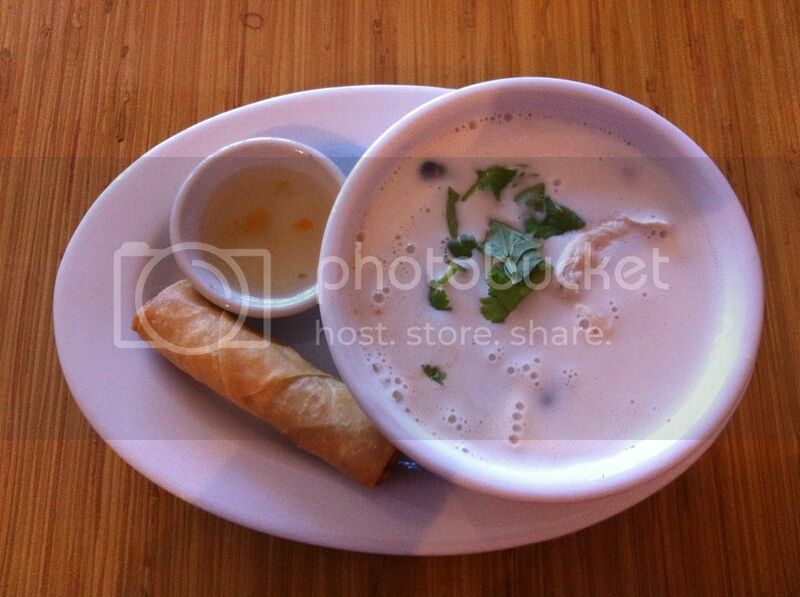 The soup also comes with an eggroll, I've never been a fan of egg rolls so I didn't pay much attention to it. 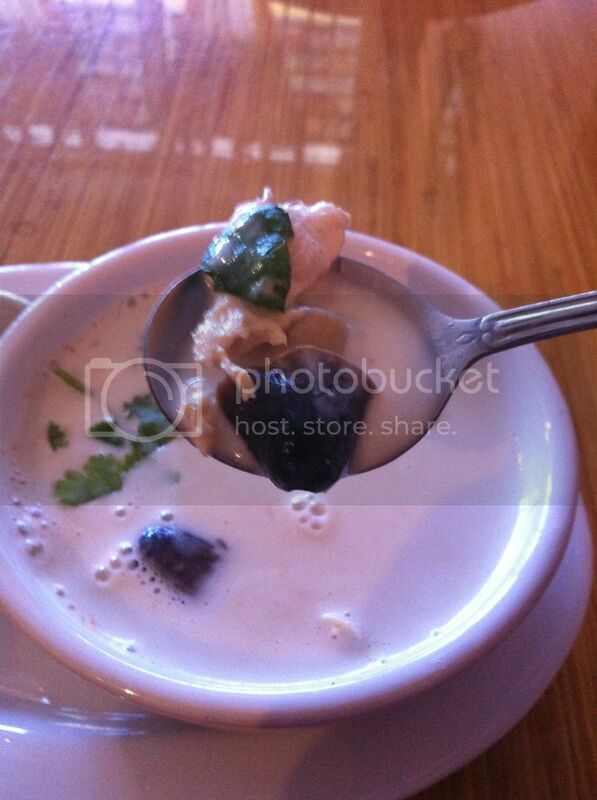 My whole attention was on the soup and the aroma permeating from the bowl. It was delicious, it had a great lemon flavor that popped in your mouth, but a light creaminess from the coconut milk. The cilantro also added a nice hint of flavor that played well with the other lemon and lemongrass. The chicken breast and mushrooms both absorbed the flavor of the soup. I literally slurped up the last bit of this like it was the last bit of milk in the cereal bowl, it was awesome. Up next I decided to go with one of their specials, Pumpkin Curry. It sounded interesting and I decided to try it out. 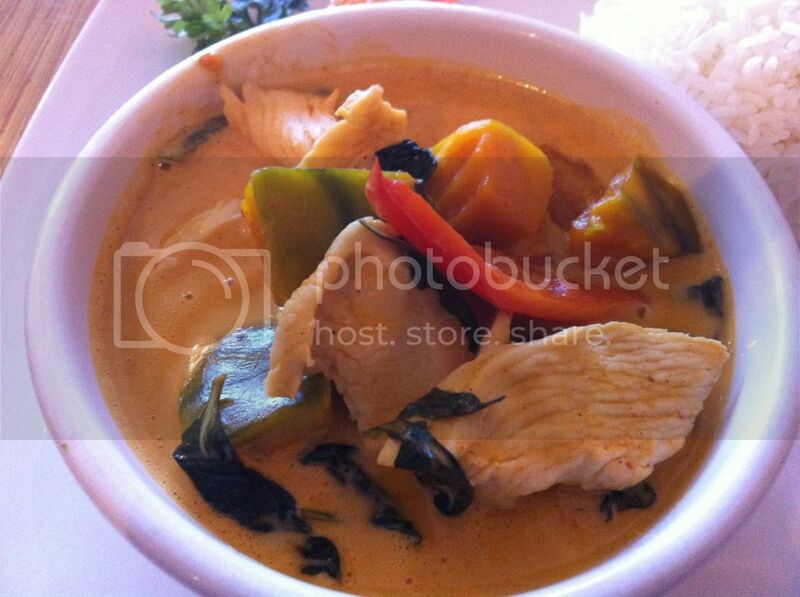 The dish comes with your choice of meat, red curry, chunks of pumpkin, basil, red peppers all in a red curry sauce. Along with the curry, you’re served white rice. This dish was also great. The pumpkin was cooked slightly al dente so it had a little bit of a bite and was able to hold its form. The curry sauce was so flavorful and not insanely spicy, but enough to give you a slight kick. 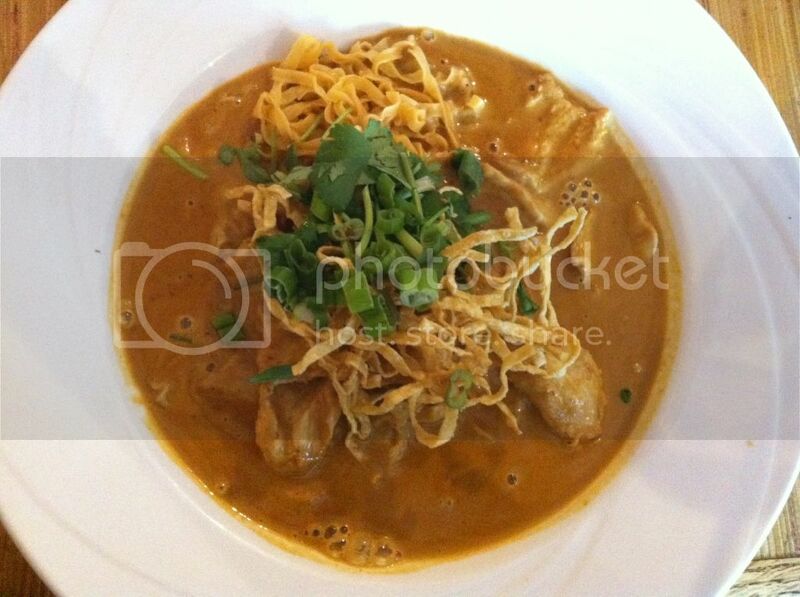 The mild sweetness of the pumpkin with the curry complimented one another perfectly. I went with chicken as my protein as my waitress wisely suggested. I got every last drop of that curry sauce and poured it all over my rice, it was that good. I was tempted to lick the plate, but I decided to not be una salvaje. On my second visit, I dragged along my best friend. We started out with their Curry Puffs (think Thai empanadas) According to the menu they're fried pastry stuffed with ground chicken, onions, potatoes, yellow curry, sweet potatoes and served with cucumber relish. Now what we got had no chicken in it whatsoever, it was tasty but ain't no chicken up in there. The cucumber relish referenced in the menu looked more like sweet and sour sauce with chopped cucumber. It was good, but the menu was a little misleading on this one. 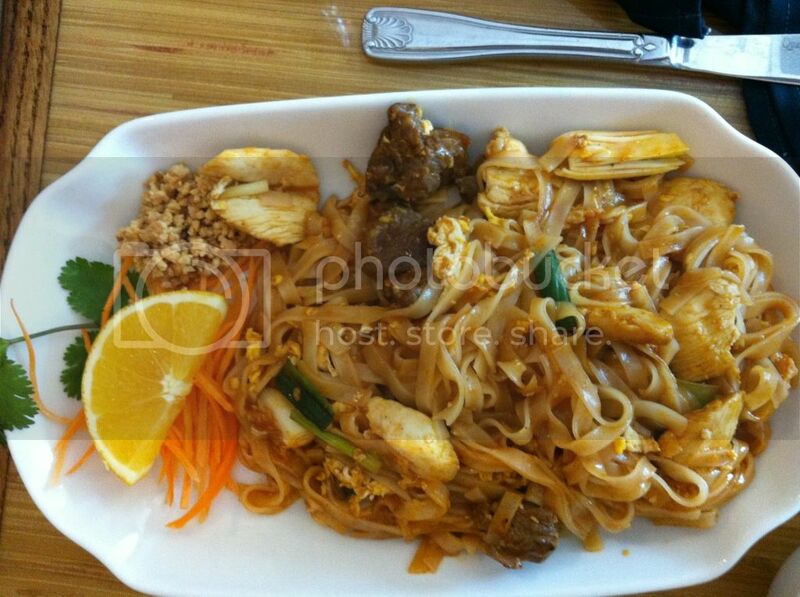 My best friend had their Pad Thai with chicken AND beef, because he's tremenda gorda. 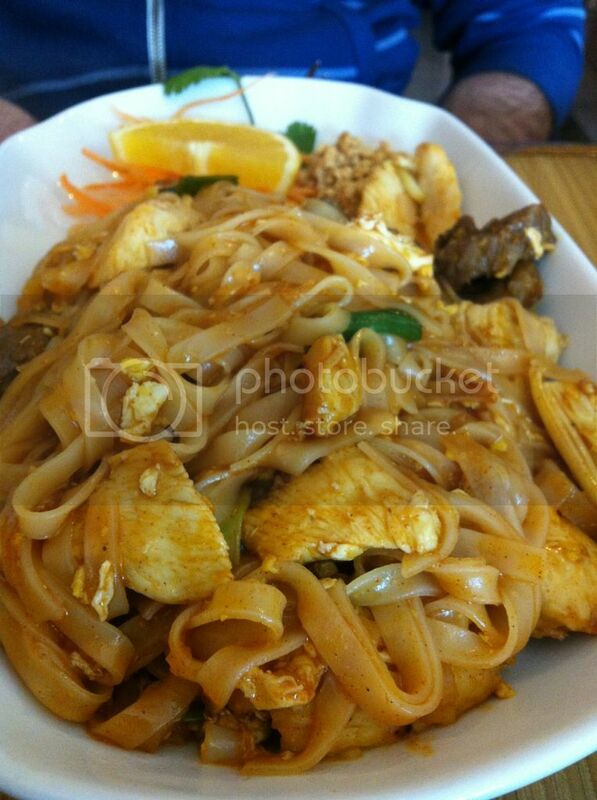 The pad thai was true to form and tasted like good traditional pad thai, nothing outstanding or innovative here. I will mention the beef was a bit chewy, but other than that it was a solid dish. 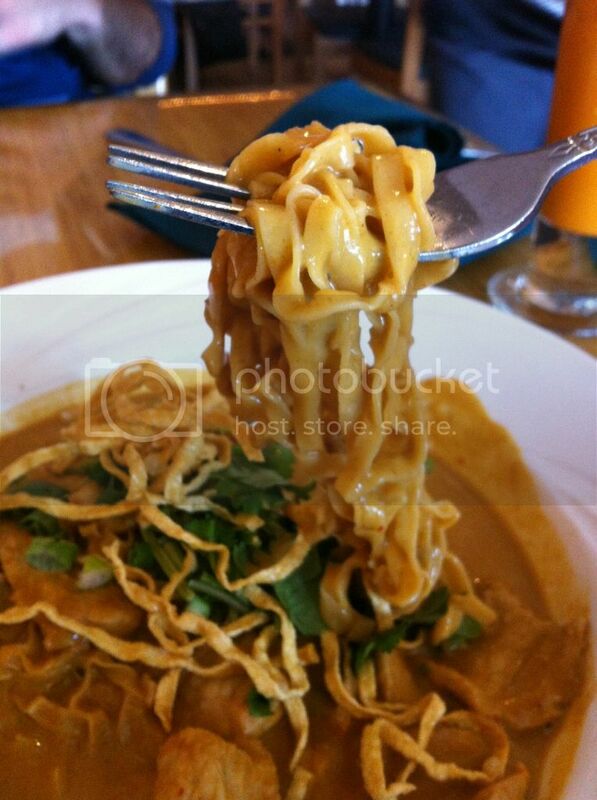 I had their Kao Soi which is egg noodles sauteed with your choice of meat in a curry/coconut milk sauce. I went with pork as the waitress suggested. 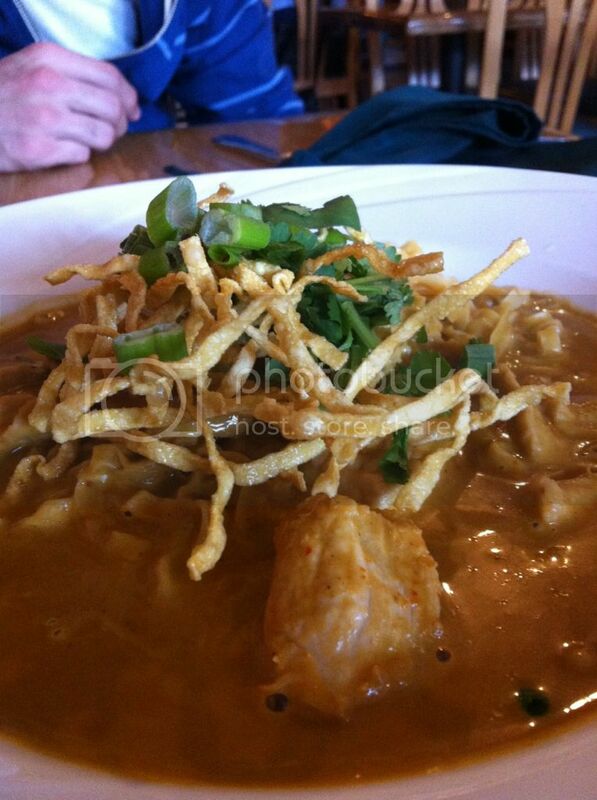 The dish came garnished with some fried noodles over the top, some diced cilantro and green onions. My best friend said it looked like, “Boogie Hamburger Helper,” but that's only because he had Pad Thai and was jealous. Sure enough within seconds my gorda best friend was saying, “Pero you gonna let me try that, right?” I loved this dish, it was spicy and creamy all at the same time. The pork tasted great and the fried noodles gave it an extra little crunch. After a while my best friend was trying to distract me with lines like, "Oh my god, isn't that so-and-so?" so he can steal food off my plate while I turned away. This place has quickly become one of my go-to lunch spots, but be warn of a couple things: 1. During the lunch rush service isn't the best and the wait staff takes longer than usual to swing by your table to check on you. 2. 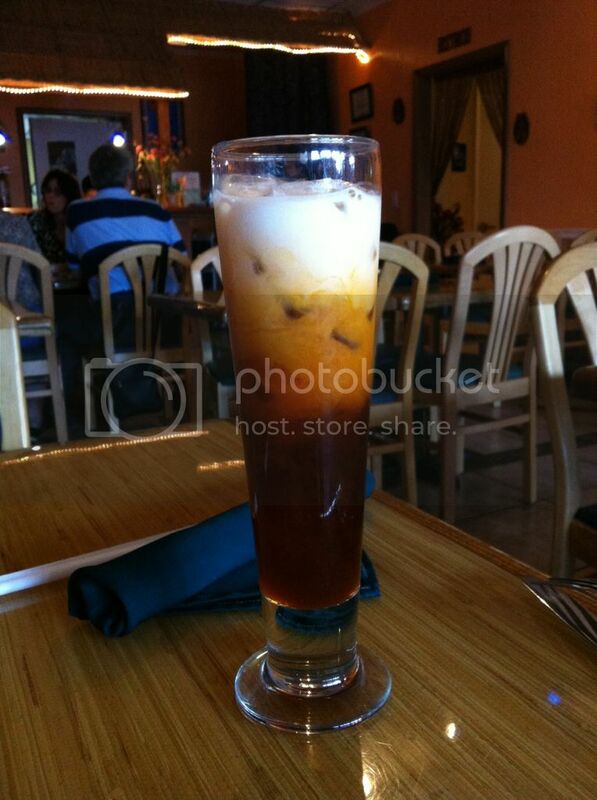 They have great Thai Iced Tea. 3. The 3 waitresses that have attended me have had THICK accents, to the point where I just smile and nod whenever they talk. So I try to ask as little questions as humanly possible and get straight to the point. 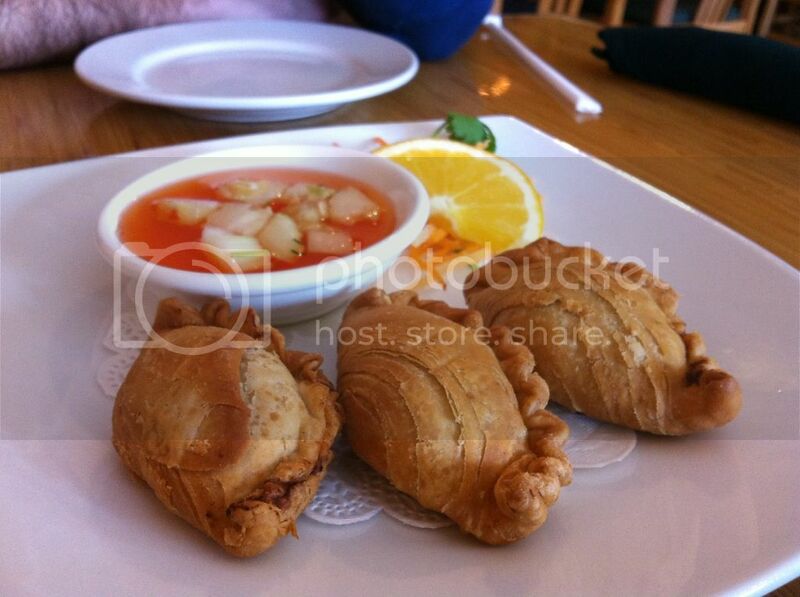 Luckily, most of the menu items have pictures, so you don't have to guess too much. Right in my 'hood! and I had no idea. This is what I really like about taking a food trip in the mazes of Doral. It was like in every corner, there is something unique you can find. 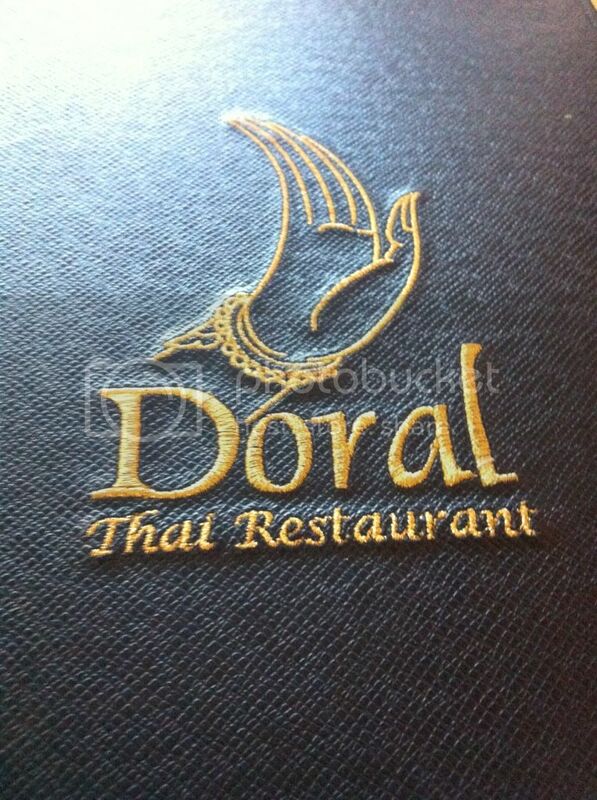 Cuban, Peruvian, Japanese, Chinese, Korean as well as Latin American cuisines, all are scattered in Doral. I was at Charlie’s Bistro and Bar restaurant in Doral the last time, and the Latino foods are handed in well-crafted plates (see at http://www.charliesbistroandbar.com/concept.html for more of their concept). Very delicious!